DNA were pretty good and they wowed the audience and panel with their magic. I don't normally watch the programme. Well, when I say normally, I mean I have never watched it, but I was sent this link by a colleague who wanted to know how they did it. Truth be told, the technique they used was one from music halls and variety shows years ago, so it just goes to prove that showmanship does survive, even if the music halls didn't. That's not to say it's easy, as it's not, and to carry out this routine in the slick way they did takes many months of rehearsal and working together, but I'll say no more as one doesn't give away such good stuff, and anyway, I'd never fit it into a blog post, as it takes some explaining. "But it has inspired some people to take an interest in magic and illusion again, and that can only be for the good." 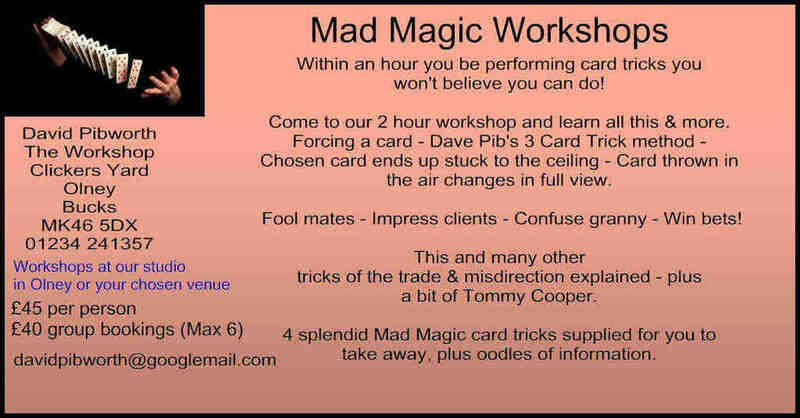 So if you do come to one of my magic workshops, I'll give you a brief run down of how it was done (and the changing tee shirts which is easier) but don't think you'll go out doing the mentalism bit tomorrow, as you won't. It does take some doing. In these days of gloom and despair over possible world wars, I suggest you take up a hobby to keep your mind off it all, and what better than a bit of magic? A few of my friends are worried about world wars on Facebook, but my advice is just to ignore it. I've heard it all before, as you do when you get middle aged. And anyway if it does happen there's not much that we can do about it, and you may as well be doing a card trick as against worrying about it. Ok, that's not the advice I would be giving to Trump, Putin, or the bloke from North Korea, but then it's unlikely that they'll be reading this. If they are, then I suspect we might be in trouble. Hey ho. Keep the magic going! Someone has to cheer everyone up in these strange and unusual times.